For other uses, see The Sunday Times (disambiguation). The Sunday Times has acquired a reputation for the strength of its investigative reporting – much of it by its award-winning Insight team – and also for its wide-ranging foreign coverage. It has a number of popular writers, columnists and commentators including Jeremy Clarkson and Bryan Appleyard. A. A. Gill was a prominent columnist for many years. It was Britain's first multi-section newspaper and remains substantially larger than its rivals. A typical edition contains the equivalent of 450 to 500 tabloid pages. Besides the main news section, it has standalone News Review, Business, Sport, Money and Appointments sections – all broadsheet. There are three magazines (The Sunday Times Magazine, Culture, and Style) and two tabloid supplements (Travel and Home). It has a website and separate digital editions configured for both the iOS operating system for the Apple iPad and the Android operating system for such devices as the Google Nexus, all of which offer video clips, extra features and multimedia and other material not found in the printed version of the newspaper. The paper publishes The Sunday Times Rich List, an annual survey of the wealthiest people in Britain and Ireland, equivalent to the Forbes 400 list in the United States, and a series of league tables with reviews of private British companies, in particular The Sunday Times Fast Track 100. The paper also produces an annual league table of the best-performing state and independent schools at both junior and senior level across the United Kingdom, entitled Parent Power (with additional information available online), and an annual league table of British universities and a similar one for Irish universities. It publishes The Sunday Times Bestseller List of books in Britain, and a list of the "100 Best Companies to Work For", focusing on UK companies. It also organises The Sunday Times Oxford Literary Festival, held annually, and The Sunday Times Festival of Education, which takes place every year at Wellington College. Evans was appointed editor of The Times in February 1981 and was replaced at The Sunday Times by Frank Giles. In 1983, the newspaper bought the serialisation rights to publish the faked Hitler Diaries, thinking them to be genuine after they were authenticated by the own newspaper's own independent director, Hugh Trevor-Roper, the historian and author of The Last Days of Hitler. Under Andrew Neil, editor from 1983 until 1994, The Sunday Times took a strongly Thatcherite slant that contrasted with the traditional paternalistic conservatism expounded by Peregrine Worsthorne at the rival Sunday Telegraph. It also built on its reputation for investigations. Its scoops included the revelation in 1986 that Israel had manufactured more than 100 nuclear warheads and the publication in 1992 of extracts from Andrew Morton's book, Diana: Her True Story in Her Own Words. In the early 1990s, the paper courted controversy with a series of articles in which it rejected the role of HIV in causing AIDS. During Neil's time as editor, The Sunday Times backed a campaign to prove that HIV was not a cause of AIDS. In 1990, The Sunday Times serialized a book by an American conservative who rejected the scientific consensus on the causes of AIDS and argued that AIDS could not spread to heterosexuals. Articles and editorials in The Sunday Times cast doubt on the scientific consensus, described HIV as a "politically correct virus" about which there was a "conspiracy of silence," disputed that AIDS was spreading in Africa, claimed that tests for HIV were invalid, described the HIV/AIDS treatment drug AZT as harmful, and characterized the WHO as an "Empire-building AIDS [organisation]." The pseudoscientific coverage of HIV/AIDS in the Sunday Times led the scientific journal Nature to monitor the newspaper's coverage and to publish letters rebutting Sunday Times articles which the Sunday Times refused to publish. In response to this, the Sunday Times published an article headlined "AIDS - why we won’t be silenced", which claimed that Nature engaged in censorship and "sinister intent". In his 1996 book, Full Disclosure, Neil wrote that the HIV/AIDS denialism "deserved publication to encourage debate." That same year, he wrote that the Sunday Times had been vindicated in its coverage, "The Sunday Times was one of a handful of newspapers, perhaps the most prominent, which argued that heterosexual Aids was a myth. The figures are now in and this newspaper stands totally vindicated... The history of Aids is one of the great scandals of our time. I do not blame doctors and the Aids lobby for warning that everybody might be at risk in the early days, when ignorance was rife and reliable evidence scant." He criticized the "AIDS establishment" and said "Aids had becme an industry, a job-creation scheme for the caring classes." In common with other newspapers, The Sunday Times has been hit by a fall in circulation, which has declined from a peak of 1.3 million to just over 710,000. It has a number of digital-only subscribers, which numbered 99,017 by January 2019. The paper ran a story[when?] claiming Queen Elizabeth II, who generally maintains a strictly impartial role politically, was upset with the style of Margaret Thatcher's leadership. In January 2010, The Sunday Times published an article by Jonathan Leake, alleging that a figure in the IPCC Fourth Assessment Report was based on an "unsubstantiated claim". The story attracted worldwide attention. However, a scientist quoted in the same article later stated that the newspaper story was wrong and that quotes of him had been used in a misleading way. Following an official complaint to the Press Complaints Commission, The Sunday Times retracted the story and apologised. 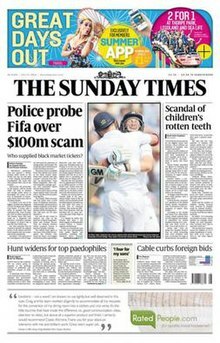 In June 2014, the Insight team at The Sunday Times published a front-page story "Plot to buy the World Cup" that detailed how Qatar used secret slush funds to make dozens of payments totalling more than $5m to senior officials at FIFA to ensure the country won enough votes to secure hosting rights to the 2022 FIFA World Cup. The revelation prompted calls for Qatar to be stripped of the World Cup. The reporting by Jonathan Calvert and Heidi Blake won numerous awards, including the Paul Foot Award. It also formed the basis for the book by Calvert and Blake, published by Simon and Schuster, The Ugly Game. In June 2015, The Sunday Times ran a lead front article titled "British spies betrayed to Russians and Chinese". The article was controversial because it contained numerous unlikely and unsubstantiated claims. Shortly after publication parts of the online version of the article were changed quietly by the newspaper. The article appeared to be an attempt to smear the American Whistleblower Edward Snowden, thus fuelling further doubt as to its independent editorship. In July 2011, The Sunday Times was implicated in the wider News International phone hacking scandal which primarily involved the News of the World, a Murdoch tabloid newspaper published in the UK from 1843 to 2011. Former British prime minister Gordon Brown accused The Sunday Times of employing "known criminals" to impersonate him and obtain his private financial records. Brown's bank reported that an investigator employed by The Sunday Times repeatedly impersonated Brown to gain access to his bank account records. The Sunday Times vigorously denied these accusations and said that the story was in the public interest and that it had followed the Press Complaints Commission code on using subterfuge. The Irish edition of The Sunday Times was launched on a small scale on 1993 with just two staff, Alan Ruddock and John Burns (who is at present associate editor). It used the slogan "The English just don't get it". It is now the third biggest-selling newspaper in Ireland measured in terms of full-price cover sales (Source: ABC Jan–June 2012). Circulation had grown steadily to over 127,000 in the two decades before 2012 but has declined since and currently stands at 60,352 (Jan to Jun 2018). Wikimedia Commons has media related to The Sunday Times. Published 28 April 2015. Retrieved 9 December 2016. ^ Mark Wallace. "The centre right press delivers a withering verdict on Cameron's EU renegotiation demands | Conservative Home". Conservative Home. Retrieved 3 January 2016. ^ "The Sunday Times - Data - ABC | Audit Bureau of Circulations". www.abc.org.uk. ^ "ABCs: National Sunday newspaper circulation January 2012". The Guardian. UK. 10 February 2012. Retrieved 7 October 2012. ^ Pritchard, Stephen (1 January 2006). "Unravelling the DNA inside Britain's oldest Sunday paper". The Observer. UK. Retrieved 17 August 2009. ^ "Middle East | Vanunu: Israel's nuclear telltale". BBC News. 20 April 2004. Retrieved 16 October 2012. ^ Ball, Philip (2006-10-02). "When it's time to speak out". News@nature. doi:10.1038/news061002-12. ISSN 1744-7933. ^ a b c d e f McKnight, David (2009). "THE SUNDAY TIMES AND ANDREW NEIL". Journalism Studies. 10 (6): 754–768. doi:10.1080/14616700903119891. ^ Franklin, Bob (ed.). Social Policy, the Media and Misrepresentation. Routledge. p. 72. ^ Neil, Andrew (1996). "The great Aids myth is finally laid to rest". The Sunday Times. ^ "42. John Witherow | Media". The Guardian. London. 9 July 2007. Retrieved 16 October 2012. ^ a b The Sunday Times Insight team (17 October 2010). "World Cup votes for sale". The Sunday Times. Retrieved 16 October 2012. ^ "A tribute to Marie Colvin". The Sunday Times. 22 February 2012. Retrieved 16 October 2012. ^ "The Sunday Times tablet edition - Data - ABC | Audit Bureau of Circulations". www.abc.org.uk. ^ "Travel Magazine (Monthly) - The Sunday Times". News UK. Retrieved 19 June 2018. ^ "Famous stories". Gale.cengage.co.uk. Retrieved 16 October 2012. ^ "New-style abuse of press freedom". Nature. 366 (6455): 493–494. December 1993. doi:10.1038/366493a0. PMID 8255275. ^ "Hitler apologist does deal for Goebbels war diaries: 'Sunday Times'". The Independent. 3 July 1992. ^ Patricia Wynn Davies, Political Correspondent (11 July 1994). "MPs face 'cash for questions' inquiry". The Independent. London, UK. Retrieved 16 October 2012. ^ Rhys Williams Media Correspondent (8 July 1995). "'Sunday Times' pays Foot damages over KGB claim". The Independent. London, UK. Retrieved 16 October 2012. ^ Roy Greenslade (22 February 2012). "Marie Colvin obituary". The Guardian. London, UK. Retrieved 16 October 2012. ^ The Sunday Times Insight Team. "Labour peer Baroness Uddin claims £100,000 expenses on empty flat". The Sunday Times. Retrieved 16 October 2012. ^ a b David Adam (24 March 2010). "Forests expert officially complains about 'distorted' Sunday Times article". The Guardian. London, UK. ^ Roy Greenslade (21 June 2010). "Sunday Times apologises for false climate story in a 'correction'". The Guardian. London, UK. ^ George Monbiot (24 June 2010). "Sunday Times admits 'Amazongate' story was rubbish. But who's to blame?". The Guardian. London, UK. ^ Times Insight (21 March 2010). "Stephen Byers: 'I'm like a cab for hire – at up to £5,000 a day'". The Sunday Times. Retrieved 16 October 2012. ^ "Two Euro MPs quit amid lobbying allegations". BBC. 21 March 2011. Retrieved 16 October 2012. ^ Insight: Heidi Blake and Jonathan Calvert (25 March 2012). "Tory treasurer charges £250,000 to meet PM". The Sunday Times. Retrieved 16 October 2012. ^ Jonathan Leake (16 September 2012). "Only 100 adult cod in North Sea". The Sunday Times. ^ Hannah Barnes & Richard Knight (29 September 2012). "North Sea cod: Is it true there are only 100 left?". BBC News. ^ "Lance Armstrong: Sunday Times sues cyclist for up to £1m". BBC Sport. 23 December 2012. Retrieved 26 June 2013. ^ "Anti-Semitic Cartoon in The Sunday Times". ADL. 28 January 2013. Retrieved 26 June 2013. ^ "Rupert Murdoch on Twitter". Twitter. ^ Greenslade, Roy (4 February 2013). "Sunday Times apology for Netanyahu cartoon". The Guardian. London, UK. Retrieved 26 June 2013. ^ Burrell, Ian (29 January 2013). "Rupert Murdoch's Twitter slap-down has big implications - and not just for News Corp editors". The Independent. London, UK. ^ Blake, Jonathan Calvert and Heidi (2014-06-01). "Plot to buy the World Cup". The Sunday Times. ISSN 0956-1382. Retrieved 2019-02-07. ^ Times, The Sunday (2014-06-01). "Plot to buy the World Cup: reaction from around the world to the Fifa files". The Sunday Times. ISSN 0956-1382. Retrieved 2019-02-07. ^ Jackson, Jasper (2015-02-26). "Fifa Files exposé by Sunday Times joint winner of Paul Foot Award 2014". The Guardian. ISSN 0261-3077. Retrieved 2019-02-07. ^ The Ugly Game. 2017-06-27. ISBN 9781501132964. ^ "The Sunday Times' Snowden Story is Journalism at its Worst — and Filled with Falsehoods". The Intercept. ^ Martinson, Jane (15 June 2015). "Sunday Times drops claim that Miranda met Snowden before UK detention". The Guardian. ^ "Sunday Times Reporter Tries To Defend Snowden Story". Huffington Post. 15 June 2015. ^ Burns, John; Jo Becker; Alan Cowell (12 July 2011). "Gordon Brown Says Newspaper Hired 'Known Criminals'". The New York Times. Retrieved 12 July 2011. ^ Holt, Gerry (12 July 2011). "Gordon Brown allegations: What is blagging?". BBC. Retrieved 12 July 2011. ^ Davies, Nick; David Leigh (11 July 2011). "News International papers targeted Gordon Brown". The Guardian. UK. Retrieved 12 July 2011. ^ John Waters (1 October 1996). "Jesuit's press edict continued a grain of truth". The Irish Times. Retrieved 21 September 2016. ^ "The Irish Times - Data - ABC | Audit Bureau of Circulations". www.abc.org.uk. ^ Slattery, Laura. "'The Irish Times' had combined daily circulation of 77,988 in second half of 2017". The Irish Times. ^ "PROFILE: Rory Godson, Powerscourt - A PR 'novice' with an international outlook". PR Week. 21 November 2003. ^ "Irish daily to use IoS team". Press Gazette. 26 June 2013.